I found a wide variety of articles and memorabilia that once belonged to Aunt Marian in my parent’s attic. 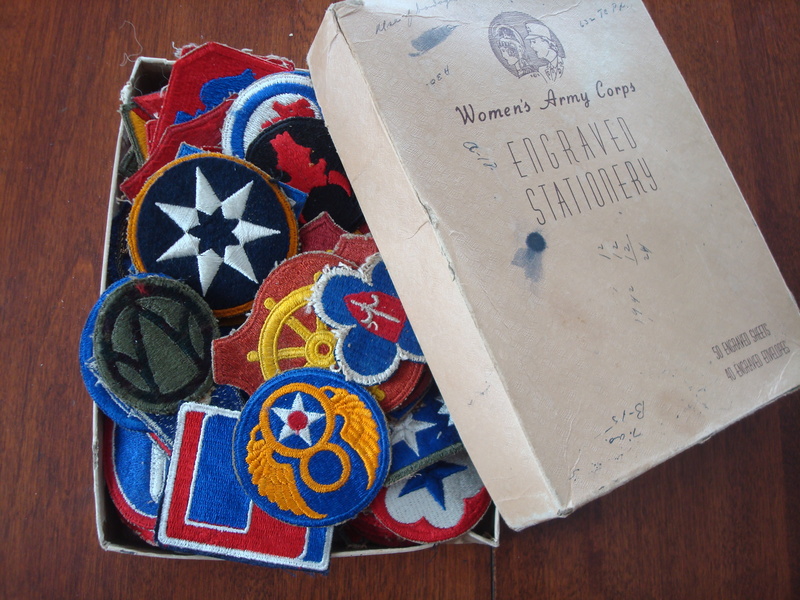 One of the more mysterious items is a box overflowing with miscellaneous military badges. Many appear to be used—a few look new. How (and why) did Aunt Marian assemble this collection of badges? Did people trade badges? One thought, but it may be totally off base (no pun intended)–Aunt Marian was stationed at Fort Ord on the Monterey Peninsula in California in the mid-1950s, and worked for awhile at the Quartermasters Sales Store. Could she have somehow gotten the badges off used uniforms that one way or another ended up the store? 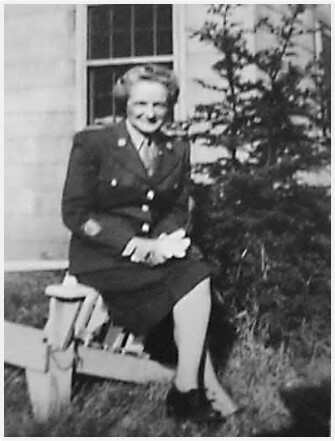 Previous PostWorking at the Fort Ord Quartermaster Store in 1956Next PostHow Much Did WACs Earn in WWII? . . . and What Were the WAC Grades? Your guess sounds totally logical, but don’t you wish your Aunt Marian had left a note of explanation in the box too? You have quite a mystery on your hands here. I know, I wish I could come up with an explanation that seemed right to me. Don’t know the answer to the questions, but I do like the photo of the box of badges. Very nice. Thanks, it’s nice to hear that you liked the photo. They are a fine collection. They would look nice appliqué to a quilt. Did Aunt Marian sew? She probably did. I’ve definitely heard that she liked to do embroidery and other needlework. Your idea of a quilt is intriguing. I’ll have to think about it. People were so thrifty back then. I can remember playing with all the buttons in my mother’s button jar when I was a kid. Reminds me of my Brownie badges. I think your explanation is highly likely. And, your comment reminds me that I have some girl scout badges of my daughter’s tucked away somewhere. We got them about the time she lost interest in girl scouts and I never got them sown onto her uniform. Would be so neat to know why these were so special to her that she saved them…perhaps someone reading this will know the significance of some of these badges? I’m keeping my fingers crossed that someone has some information. Maybe you need research what each badge represents. When my daughter was in the RAAF (Royal Australian Air Force)she (several times) took part in combined military forces actions :One was called Operation Pitch Black, and many badges were swapped with USAF, Singaporean, NZ and RSA personnel.. She had interesting and varied badges and stories to share. What a pity Aunt Marian didn’t include a note in her box of treasures. Maybe Aunt also swapped badges. It’s on my “to-do” list to research some of the badges. 1940s WW2 Vintage U.S. ARMY SERVICE FORCES SHOULDER PATCH The one in the bottom right Blue Star on white with red trim. Thanks for the information. I didn’t know what that one was. The only ones I’ve figured out so far are a few of the WAC ones. I expect some of them would have been hers. Have you been in touch with the Women’s Army Museum? They may be able to identify all the badges. I sent them a genera email prior to starting the blog to see if they had anything about Aunt Marian. I didn’t ask about the badges–but it would be a good question for them. Indeed. Have you visited the museum, or would you be able to? Meanwhile, I am focusing on the box. I love the fact that WAC had its own engraved stationery. That makes sense. it definitely looks like a collection of some sort. If she was working in the quartermasters office she may have been tasked at changing the badges and strips. The quartermaster was where you turned your laundry in to be done. and where you picked it up. If your rank or unite changed you could have that done there. If you needed your uniform altered that would have been done through the quartermasters. Sometimes people didn’t want all their badges back after they were changed. I don’t know if they were charged for it then. I know later it would come out of your pay at the end of the month. Used badges would have been used over in some cases if new ones where not in stock. After the war there was a draw down and many units were disbanded and those badges were no longer needed so when you google WWII badges you may find most of them from units that was disbanded. She may of been able to keep a sample of each one because they were being thrown out. Thanks for the explanation. The way you describe it sounds very plausible. I also want to tell you some of those badges or patches is worth some money. The one laying on the top in that picture, blue background, gold wings and star. That is the 8th Army Air Corp( European Theater) has a value of about $15 or more. The one with the boat wheel is the Port of Embarkation patch that is uncommon also. If she was nice looking she probably didn’t have any trouble getting badges given to her. 🙂 I’ve been wanting to research some of these badges, but hadn’t gotten around to actually doing it. Your comment is motivating me to start doing it.